but I thought I’d post it here for all of you to see as well! You can sort of tell what the inside of my heart looks like if you stare real close. We have so much of the same stuff! Rody, IKEA board, etc. And!!! I forgot about our 2007 photo booth adventures in LA! Awww. I love your toy pianos, they’re amazing! 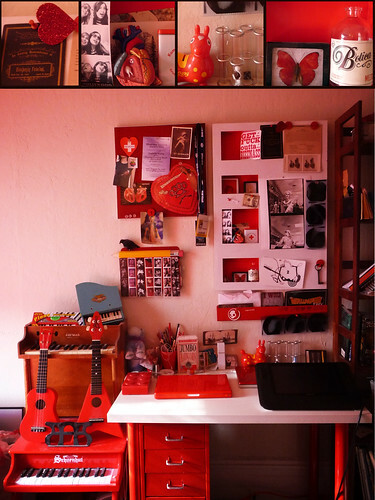 I am in love with all the red around your workspace! !